The best part of this book is the cover art. This was poorly written derivative work, a true wet dog of a book, narrated by someone who cuts off the end of every sentence as if he'd just explained why your dog died on his property and how it was all your fault. What would have made Ark Royal better? Deliver on the potential excitement. Remove the cringeworthy internal dialogue. 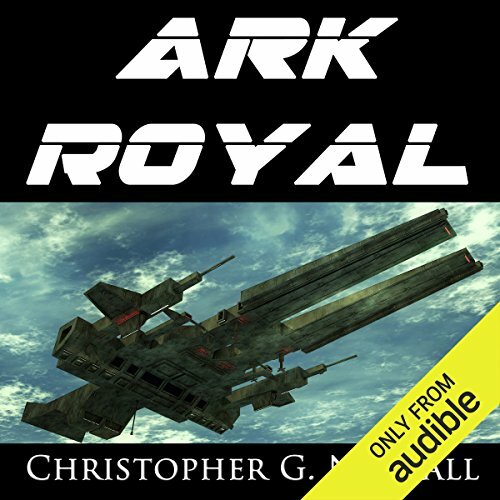 If you’ve listened to books by Christopher G. Nuttall before, how does this one compare? 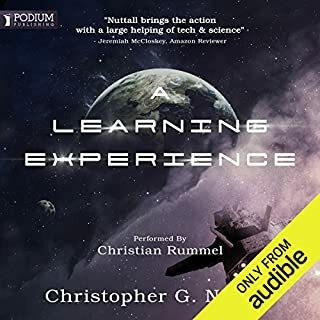 This is the first Chris Nuttall book I've listened to... and more than likely the last. The voices were laughable (and I don't mean funny) and the delivery disjointed. Left me wishing he would just read in a relatively fast monotone. The idea was interesting, reminiscent of the Lost Fleet series. But there it ends I'm sorry to say. What other book might you compare Ark Royal to, and why? Which character – as performed by Ralph Lister – was your favourite? While the story is fairly standard it's cultural placement and modern traditionalism increases it's interest. Also the story provides the required adventure, intrigue and military framework to satisfy most readers. A point to note here is that I am an English born Australian embued with the traditions and accents expressed. This may challenge some reader's but if you enjoy Patrick O'Brian or the Hornblower stories this may interest you. I look forward to the next and future editions of this series. 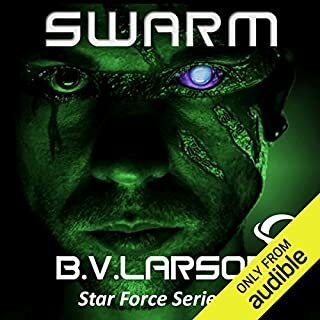 Really enjoyed this series and highly recommend for those who enjoy good science fiction. Looking forward to more works by this writer. If you like Jack Campbell, You'll Love C Nuttall! 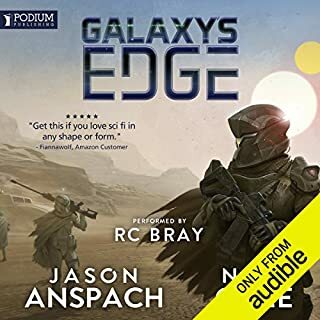 Since nothing here restricts me to three words, I'm just going to let you all know that this book has the feel of space drama, the action of mil-scifi, and a development of character to rival its peers. I strongly recommend a listen. Good fun! What was one of the most memorable moments of Ark Royal? Definitely the development of the underdog status of the Ark Royal (Space Carrier), as an old ship, and the challenges faced by her crew. Really well written. The early scene where Commodore Smith is ordered to relinquish command, and his powerful defense of his position. Overall a fun read. I usually listen to this on night shift at my workplace. Despite the nature of my role, I found consistently imagining what happens next, daydreaming about the situations the crew found themselves in, and keen to continue listening when interrupted by pesky work! If you are looking for a great way to engage in a different universe, or some fun escapism, I really can't recommend this enough. ENJOY!!! Its nice to have English read they way it was intended. there were moments of "good man" and "sort yours#!t out" being internally shouted at certain characters. So its 300 years in the future, but the political structures on Earth haven't changed since the 1950s? The Ark Royal is a (space) carrier of the British Royal (space) Navy. They fly (space) Spitfires and shoot at (space) enemies. I gave up before they could reveal the bad guys were (space) Nazis led by (space) Hitler. The only thing worse that the story was the performance. Every character, including the female ones, sounded like an angry Rene Auberjonois with a sore throat. I couldn't tell which was which, and I didn't care. 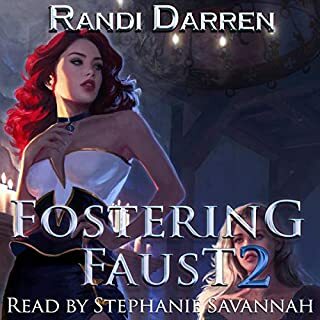 This is the first audiobook I have given up on without finishing. I quit about three hours in. 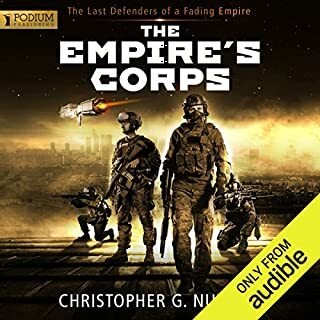 When you read the publishers blurb, you might be forgiven for thinking that this looks like a cross between Battlestar Gallactica and David Feintuch's "Seafort" space navy saga (Midshipman's Hope, etc). Having finished the book, you might well, as I did, still think the same. The story is not bad, but, for me, there is not nearly enough world-building. 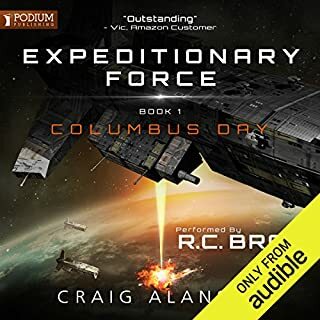 It is set in a future earth where individual countries are building national space navies, colonizing planets and fighting interstellar wars against other countries. How we get from where we are now to that stage is not well explained. Also not well enough explained is the central opening plot theme, where humanity’s navies suddenly decide move away from heavily-armoured naval space ships and certain types of weapons. I was still wondering why at the end of the story. Battlestar Gallactica handled that better. I am afraid that the narration is poor. Ralph Lister has a tendency to read the prose in bursts, with his … pauses often not tieing … in with the natural … flow of the sentence. As for dialogue, I sort of got the feeling that he has never actually heard two people having a normal conversation. Most of his characters address each other as if they were sergeant-majors on a parade ground, which is a little off putting. He does try to do different voices for different characters, but as they all bellow urgently at each other 90% of the time – even during the romantic bits – they do tend to start blending together indistinguishably. It’s not horrid to listen to, but it shatters the illusion in a somewhat annoying way – especially when you start listening out for it. 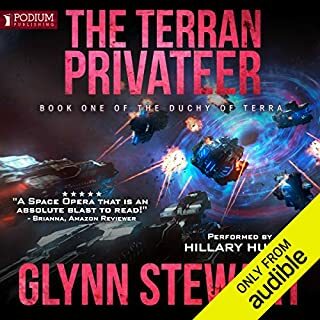 I am going to listen to the next one in this series, but I have to say that, based on this performance, seeing Ralph Lister’s name as narrator in the future is likely to make me pass over books that I might otherwise have tried. I'm actually enjoying the story, and I will probably get the sequels. It's quite enjoyable in itself. - Ralph Lister's narration is absolutely fine - when he's reading the descriptive text. However, when he starts acting as the characters it all goes wrong. and he .. talks .. like .. this. He annunciates every word precisely, rather than as people actually talk. It's strange because he reads the rest of the book absolutely fine. - I've been spoiled by Jack Campbell's Lost Fleet books. In those, he shows us the vastness of space, and the problems that combat in that environment would have. In Ark Royal, it's a bit more Star Wars-y, and space is very small. So, their ship jumps into a star system, and they get immediate communication from the planets asking who they are. Then, a bit later, an enemy ship arrives from a different direction, and a few minutes later they're in combat. Either they've discovered a way to have FTL travel, sensors and communication within a star system, or space has shrunk a bit. - Also, there's a few scientific impossibilities (ignoring the normal Sci-fi ones, like FTL travel, etc) - eg the ship was 'orbiting a beacon' - that just can't work, unless the beacon is HUGE. Apart from those little annoyances, it's not that bad a book. It could do with a bit of editing, and the voice acting is annoying, but, to me, the story's good enough to override that. This story so nearly makes it, but not quite. Perhaps this is how we will all speak in the future, characters seem to shout and bark conversations at each other quite unnecessarily. The cliches flow abundantly and some of the action is quite irrational. You can play "other scifi bingo" with it though. Spot the references to Galactica, Star Trek and others. Then there is the strange attempt at justifying unfaithfulness, which is so unconvincing you can sense the author giving up on that as a bad job and moving the story onwards. So what is good about this book? It is the first of a series that will hopefully, probably, get better. The alien-ness of the aliens is maintained throughout the story which makes me want to discover more. The premise of the story is strong enough and the threat to humanity plausible enough to keep me interested. However, where I lose it is that I really don't care about any of the characters and so by the end of the story if they sail off over the galactic horizon good luck to them. This could be due to the bland characterization created by the narrator. And here is probably the real problem. The dialogue is frequently weak, so it doesn't give Ralph Lister a lot to work with, but the vocal distinction between characters is also not good. Frequently I wasn't sure which character I was listening to and eventually I didn't care. I was excited by the idea of this story, but the implementation is fairly poor. It can't make up its mind if it is a first-contact mystery, a space-opera, or a character-development drama. As a result we have cookie-cutter characters spending paragraphs speculating about the nature and intention of vague aliens in between unexciting battles. The central story - an aged carrier called into service as humanity's last hope - is sabotaged by two plot devices that bring it about. For no particularly good reason an advanced alien species has never developed projectile weapons, and for no particularly good reason humanity has only installed them on their oldest starships, despite projectiles being far more capable than the "modern" weapons either side has equipped themselves with. 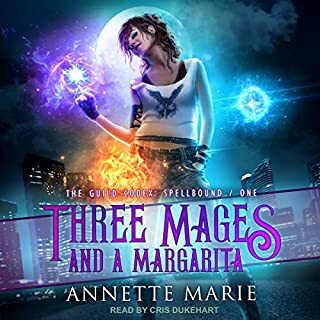 The narration is well below typical Audible standard. The speaker uses a newsreader cadence, pausing at inappropriate times and misplacing emphasis. Whenever a character is speaking he uses a new emphasis that makes them sound alike and constantly angry, regardless of the situation. This book is in dire need of a re-write. 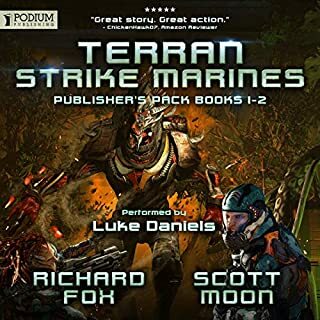 The story itself is fine and suitably entertaining, but by the time you've reached the end you be about ready to stop "playing doggo", "stagger out of formation" and "be given a bloody nose". So many phrases are repeated excessively, and concepts are laboured to the point that it feels like padding that it detracts from an otherwise engaging tale of nautical derring do. There aren't enough characters, and those who are present are caricatures rather than well rounded people, but it doesn't matter. Ralph Lister's performance often sounds like he's drunk. These negatives notwithstanding, I'd recommend the book for those looking for some boys own adventure in space with a nod toward Battlestar Galactica. Fighting navy men ponce about shouting at each other while the women serve the tea. Weirdly right wing and jingoistic. What disappointed you about Ark Royal? All characters are either unerringly right wing or portrayed as barely human scum, it's just a bit creepy. 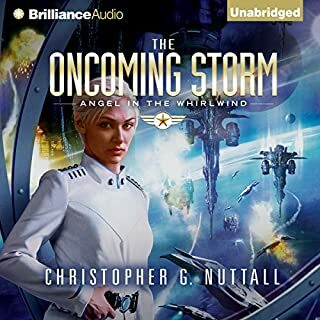 Would you ever listen to anything by Christopher G. Nuttall again? Probably not, maybe his other works are more nuanced but looking at the jingoistic titles I doubt it. Would you listen to another book narrated by Ralph Lister? Possibly, his delivery isn't bad, it just randomly slows down in places sounding robotic and he constantly emphasises odd words. What character would you cut from Ark Royal? Maybe not cut but I'd make the women and/or journalists a bit more than 1 dimensional. Maybe provide a counter opinion to the chorus of chest thumping agreement all the main characters echo. It's not like reading Heinlein who deliberately explores challenging points of view in an exciting setting. The attitudes in this book are so monochromatic it's creepy. The writing is also repetative and ham fisted. Strange, seems like a rewrite of a 40's war novel, or something earlier, hornblower even- names like Gladys and Rose, Ted, all so knowingly dated, brought forward to a Sci fi setting that just isn't that well thought out and isn't well written. Frightening old fashioned characterisations that fail to engage and are repetitive and one dimensional. There is something here, it could work but you end up feeling that it's a wasted opportunity. Firmly children's listening. Full of inconsistencies, stuff that even in Sci-Fi isn't very credible, and even for me as an ex-pat too pro-British. This is 1950's 'lantern-jawed, Bosch-bashing, British grit in the face of overwhelming odds' pulp listening. There is so little credible in the description/ research to make you feel you're a century ahead in time. I'm not sure if it's to the narrator's credit but the speaking style matches perfectly: wooden, one- dimensional, mis-stressed, it sounds more like the trailor for a bad B-movie. The emphasis is often mis-placed (e.g. angry voices, the stereotypic voicing of naval command - can anyone really believe commanders speak like that? ?, the Russian dialogue), and I can't work out what his normal voice is. I think he took cocaine and tried to rival Branagh's ability to ham it up to the hilt. It's Brits all the way, taking it on the chin and giving it back to the aliens in spades. No other countries get much of a look-in, and - surprise! - all our current bogeymen nations are still bogeymen. Nothing politically changed from Cold War 1990's in this interstellar story. I'm generally pro-Brit, but this is ridiculous. Character development is patchy and predictable (e.g. drunk washed-up captain makes good; XO initially a thruster becomes loyal & self-sacrificing; immoral unethical press; Russian cyborg). Pretty much all the characters are stereotype and unbelievable, with nothing to grab the listener. I think Google Translate wrote the characters. 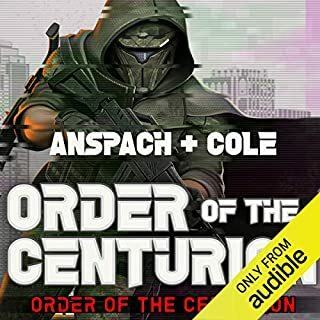 Written by a Mumbai call centre computer for the pre-teen English Defence League; and read by a misguided amateur dramatic, this is the "Sharknado" of audiobooks. Despite a curiously old-fashioned feel, both to the story and the narration, I enjoyed this. 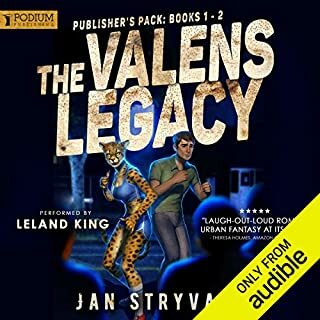 There is a little bit of the cardboard cut outs about the characters, and it felt as though the author was at a bit of a loss as to how to progress some scenes, but overall, it flowed quite nicely. I enjoyed it enough to want to know what happens in the next book. The narration was a bit wooden, but I've heard worse. It wasn't bad enough to spoil the book.